The Jell-O Mold Competition has taken Jell-O out of the cafeteria, but the time has come to take it out of the kitchen altogether and into the world at large! 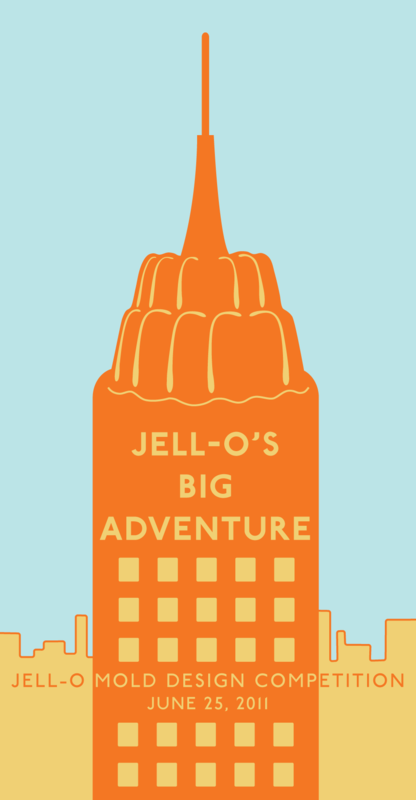 This year, Jell-O takes New York! To get things wobbling, we took Jell-O out to the city and into the classroom for a Jell-O Mold Workshop [www.gowanusstudio.org/jello/ workshop2011.html] for NYC high school students run in partnership with Cooper-Hewitt, National Design Museum and Eyebeam Art + Technology Center, with additional support from Smart Design–now it’s your turn to get in on the adventure. This year’s competition asks designers to explore the everyday uses of this wobbly, delicious, shape shifting medium. Designers will compete for a grand prize of $400 in cash, a year membership to the Cooper-Hewitt, National Design Museum, gifts from Papabubble, Holstee, and more! A crack panel of respected judges including Allan Chochinov of Core77, Emily Elsen of Four & Twenty Blackbirds pie shop, Josee Lepage of creative agency Bondtoo, and Keith Ozar of MakerBot will announce the winners at 8pm on Saturday, June 25, 2011. Anney Fresh of Space Kittys will host. The judging and awards ceremony will be held at The Gowanus Studio Space in Brooklyn. $15 registration fee, $10 for students. Space is limited, so register early!